The first meeting house was built in the Tide Mill district (the vicinity of Conary Cove and Mill Island) but the exact location is unknown. In 1768, the townsmen voted “to raise money to hire a person for to preach the gospel to us and for to pay his board”. 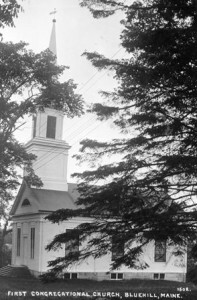 On October 7, 1772, eight men and six of their wives organized the First Congregational Church of Blue Hill. Rev. Daniel Little of Wells conducted the first service. Although Blue Hill had a Meeting House in keeping with the town’s charter, it was without a settled minister for twenty-four years. In a letter to the Massachusetts Senate and the House of Representatives in 1785, the settlers stated they had hired a preacher every summer for seventeen years, which was apparently sufficient to satisfy the charter terms. The first settled minister was Rev. Jonathan Fisher who came to the church as a summer pastor in June 1794 and was ordained as its minister July 1, 1796. He was a very faithful preacher and also became known as a versatile Yankee with a broad set of capabilities. He was interested in education, art, the building trades, farming, poetry, and languages. He and his family, including his wife Dolly, reached out to everyone in the area with love and caring. 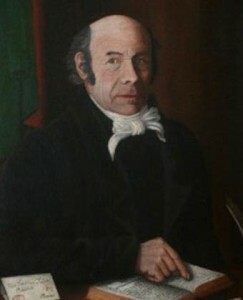 In Jonathan’s lifetime he encouraged a Blue Hill Academy, a town library, as well as the establishment of the Bangor Theological Seminary. He retired in 1837 and died ten years later. He and his wife, along with other family members, are buried in the Old Cemetery in Blue Hill. To learn more about Blue Hill’s first minister, visit The Jonathan Fisher House. As the settlement grew, it soon extended to the head of Blue Hill Bay. 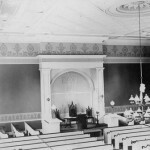 At this time it was decided to build a larger and more central meeting house. The site selected was on the north side of Tenney Hill. Work started in May 1792 with a day of entertainment for framing and raising the meeting house. Construction of the meeting house lasted almost ten years although meetings and services were held there during this time. In 1821, John Peters presented the Church with a Paul Revere bell. Reuben Dodge made a gift of a tower and steeple. The bell, which rang for the first time to celebrate the donor’s eightieth birthday, tolled one week later for his death. This meeting house burned to the ground on January 2, 1842. A tablet now marks this spot. The present and third building was dedicated in January 1843. Land had been given by Reuben Dodge and the builder was Thomas M. Lord of Blue Hill. The new building was designed in a Greek plan by B. J. Deane of Bangor. Labor and materials were contributed by members of the parish. The granite used for the foundation was from the quarries of Jedidiah Darling and his three sons, whose granite quarries and wharf were near the present yacht club (KYC). The lumber was from the many lumber yards in Blue Hill. The current bell is a recasting of the old Paul Revere Bell which fell and broke when the old meeting house burned. free of charge. Church members lodged and boarded the men. 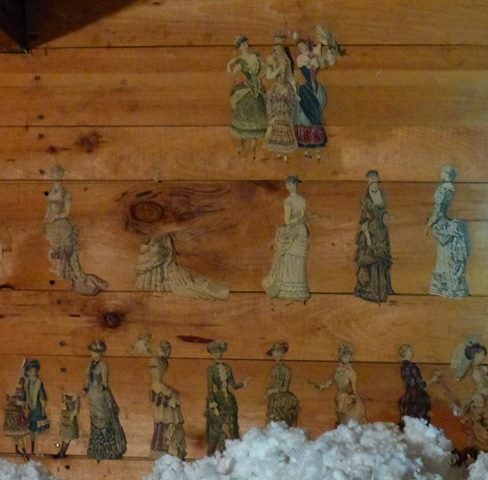 The ladies of the sewing circle provide the needed money. In 1908, the first two of our six stained glass windows were installed. The first is titled Lilies and was dedicated in memory of B. W. Hinckley and Sarah Hinckley. The second is the Angel with the Anchor. It was dedicated in memory of Rev. Jonathan Fisher and of Norman Fisher Hall, his great grandson. This window was made by Miss Mary Tillinghast of New York, a student of Mr. John LaFarge, one of the foremost artists of colored glass in the country. The third window, entitled Angel with a Sash, was given in memory of Augustus Stevens and Emaline Stevens. In 1927, the fourth and fifth windows were donated. The Angel Outside the Tomb was donated in memory of Louise E. Tenney and The Shepherd with His Flock was dedicated in memory of Capt. John P. Tenney. In 1928, the sixth window, The Cross, was given in memory of Emma Tenney Chase. 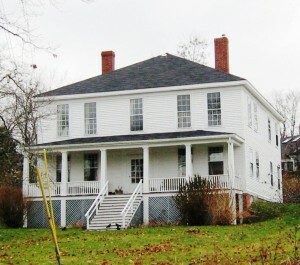 The Parsonage was originally built c.1800 by Theodore Stevens for use as his private home. Several of Stevens’ heirs lived in the house over the next 125 years, until 1925 when it was informally offered to the First Congregational Church of Blue Hill as a parsonage. In 1970, the Church was bequeathed the building and property by Ethelwyn Hinckley, a descendant of founding minister Jonathan Fisher. A total of twenty ministers, including summer and interim ministers, have made the Parsonage their home over the years. To read more about the history of the Parsonage you can find a copy of Parsonage Reflections (August 2005), at the Blue Hill Public Library. The Church Historian has the responsibility to retain historic documents, drawings, books, photographs and other ephemera describing the evolution of the church since its early beginnings. Documentation of our over 240 years of Ministry, celebrations, worship and outreach has been retained as well as books written by parishioners describing the influence of our church on the development of Blue Hill over the years. *These la mode illustrations were found on the attic wall of the Parsonage in April 2016, during renovations.